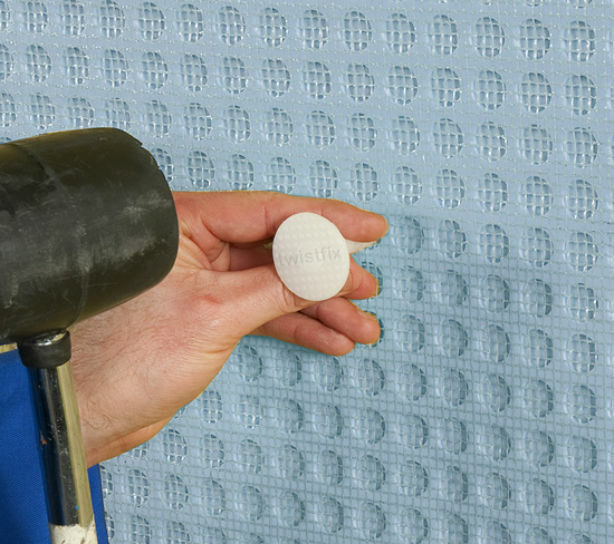 Since its introduction to the Twistfix product portfolio, the Damp Check Mesh Membrane Kit has been a staple of the professional waterproofers array of solutions. It’s instant and lasting popularity comes down to just two factors: pure product quality and consistently competitive pricing from Twistfix. After a remedial damp proof course has been installed, there is a risk of damage to internal finishes from salts and water vapour that are drying out of the walls. This is a particular problem when the area is intended for living purposes and so using a membrane is recommended to help avoid the issue. Mesh Membrane from our comprehensive kit immediately creates an effective moisture barrier, and one which is plenty durable too. 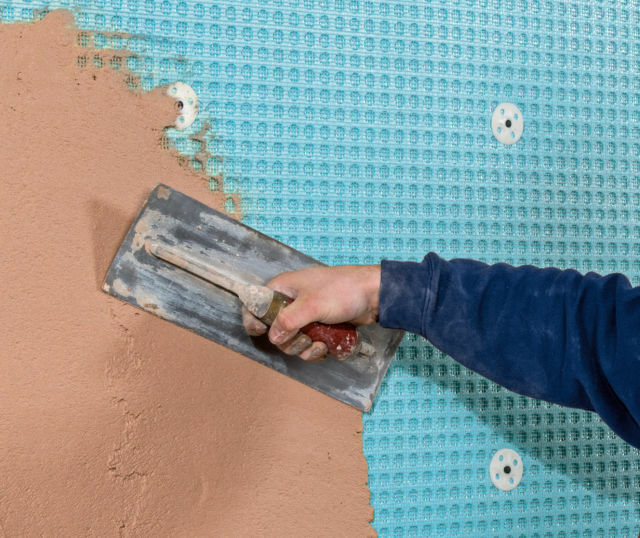 As soon as the DPC is installed and the membrane follows, reinstatement of wall plaster can begin: no more waiting around for weeks and spoiling your efficiency. Everyone loves a nice hot shower and lots of people are opting for the luxury of a full wet room; it’s just like a shower except it’s the whole room! Mesh membrane is perfect to accompany this process. The product features a mesh face which will readily accept a wide range of tile adhesives, cement renders or plasterboard dabs; the reverse side is fitted with stand-off studs separated by air gaps, letting the wall breathe naturally and keeping liquid away from it behind the membrane. 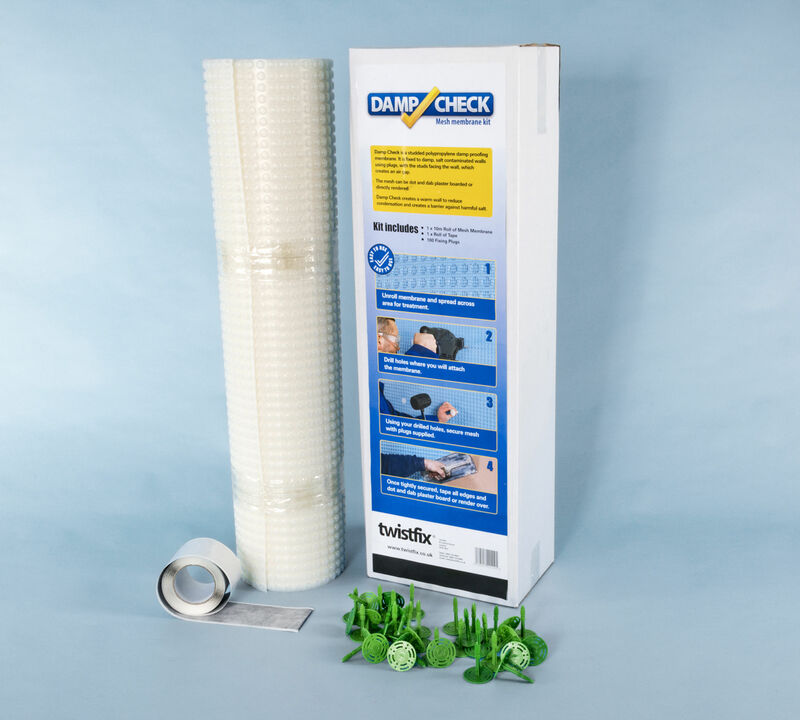 The mesh membrane kit is your best option to make sure that you’ll have everything you need to carry out the most professional and 100% successful installation.­ It contains 10m of membrane along with a matching 10m of butyl rubber waterproofing tape and 100 quality hammer-in fixing plugs. Open the box and you're ready to start; no special tools are needed to modify the membrane and ordinary scissors/­knife can be used to cut it to size. Don’t risk failure by using inferior materials. Trust Twistfix to deliver the best every time and preserve your reputation.